I do have one note about Even-ups. I used an Even-up and it really does work well. Walking without one while using an aircam is horrendous on the hips. However, I think they are too heavy. After two months with the extra weight on my shoe, the tendons at the back of my right knee (the one with the Even-up) started to tweak in pain, which started to really irritate after a week or so. So I cam up with a low-cost alternative. I duct-taped a flip-flop to the bottom of my New Balance Walking Shoe. I looked like a dork, but it worked great! And it only cost $6. Dr Blake's comment: Thank you!! Email just received from a chronic foot pain sufferer in custom orthotic devices which work great with these Finn Comfort shoes. I haven't come and seen you for a while since my feet have been doing remarkably well. I am still so amazed at how well the Finn Linz Comfort Shoes work to make all my foot pain/pronation go away. I just got back from a 6-week vacation in Europe where I walked, and walked, and walked, and walked and my feet were fine! That being said, I destroyed my pair of shoes and was wondering if you could write me a prescription for another pair so I can use my FSA to pay for them. I actually just found a really good deal online for these shoes, so it would be great if the prescription could be for 2 pairs, so I can stock up while they are so cheap. Let me know if you are unable to do this or if you have any questions. Bunions are normal bones in abnormal positions. The process of developing bunions is very slow, but some activities can speed up the formation. Shoes are blamed excessively, but are rarely the underlying cause. Managing and slowing down the development of bunions can prove very helpful to some people. And, let us say you have bunion pain. Pain can definitely bring you to the doctor for treatment, and surgery has to be in the back or front of your mind. But, is it bunion pain? It could be something else. It is best to get your bunions professionally checked. Patients can with conservative treatment, delay the need for surgery and sometimes prevent it. So, you decide you have a bunion. Your mom and/or grand mom did, so it is in the genes. What to do? There are many conservative treatments that I will try to summarize in this handout. Typically if you consistently do three or four of these self care treatments, your bunions will be much less painful. You want to avoid getting to Stage 4 Bunion Development as shown in the photo below. Stage 4 is always a surgical problem because of how it negatively effects the rest of your foot and your walking gait. You have bunions and you want to avoid surgery for as long as possible, here are your common treatments. Standard Medium Gel Toe Separators that can be purchased from Silipos. Toe Separators can be bought made of gel, foam and rubber. This image shows gel one that attaches to the second toe for more stability. Avoid the toe separator that attaches the first and second toes together since it would make the first and second toes move together whereas they normally move separately. Medium gel toe separators for weight bearing with shoes is probably the most single important aspect of conservative treatment for bunions. It is to be worn any time you are weight bearing to negate the gentle consistent push of the shoes on big toe towards the second toe. This night splint can be purchased from Footsmart.com and it is the best one I have seen. You should wear a sock over it so that the Velcro does not catch on your bedding. Over 50% of my patient feel that this is helpful when they first start their bunion care while they get use to some of the other treatments below. Slowly it will have less effect as you loosen up the tissue between the first and second toes. If the bunion is accompanied by a 2nd hammertoe as in the Stage 4 bunion above, use a Budin Splint (also known as Single Loop Hammertoe Regulator) to get the 2nd toe down. 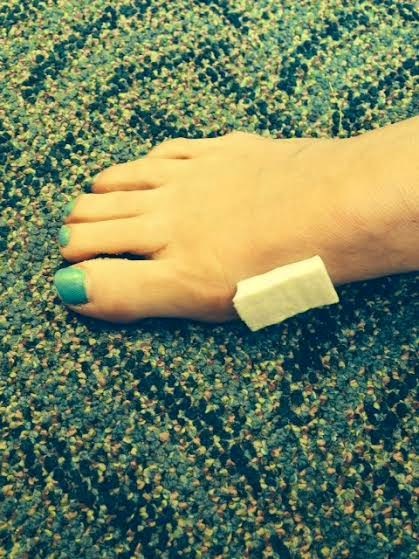 You can also use Kinesiotape, Rocktape, or 3MNexcare Waterproof tape to hold down the 2nd toe. You do not walk around with these as it could be dangerous. If you have trouble fitting between all your toes, cut out the partitions between some. It is the separation of the first and second toes that we are looking for. Also running the yoga toes under water can help lubricate the rubber to allow them to slip on your toes easier. Yoga toes are the second most important conservative treatment for bunions. They are to be worn 30 minutes per day and not to be walked on or slept with. They produce a gentle stretch on the soft tissues to help pull the toes into better position. Many of my patients use the knock offs from Bed Bath and Beyond or Walgreens, called Healthy Toes or Pampered Toes. Metatarsal Doming is the best exercise to begin strengthening the small muscles in your foot. While doing these exercises focus on moving the big toe downward and away from the second toe. The Abductor Hallucis pulls the big toe away from the second. Some patients have great difficulty separating the first and second toes and must use toe separators, Theraband, or bunion taping to place the big toe away from the second toe in order to start the exercise in the correct position. Bunion taping placed daily can help train the toes to go in the right direction (or at least a better direction). If your bunion is large (Stage 3 or 4 normally), consider a 3 month trial of bunion taping with Kinesiotape, Rocktape or 3M Nexcare Waterproof Tape. Socks or shoes with individual compartments can be worn around the house or for short errands to strengthen your toes in the correct position. Use ¼” adhesive felt from www.mooremedical.com just behind the bunion towards the arch, not over the bunion. This has probably given my patients the most pleasure since it greatly increases the amount of fashionable shoes they can wear. Therefore, I would put this as the third most important conservative treatment step for bunion care. If your bunion is red, even if it is not painful, you have some low level inflammatory tissue at the bunion prominence. This makes the bunion more fragile and more likely to get irritated with various shoes. Introducing daily 5 minute ice massage by melting an ice cube over the bunion should be done until the skin over the bunion looks normal on a consistent basis. You can speed up the process by ice massaging two or three times per day. You can substitute good hydrating cream or lotion for the massage when the bunion is not painful. Cyrocup which can be purchased online, is used here to reduce inflammation around the bunion. Ice cube in a cloth towel works well. I also love massage oils or combinations of Aloe Vera and Vitamin E.
If you pronate and your bunion hurts with certain shoes, experiment with Hapads or other OTC arch supports like Sole to see if you get pain relief. You can use custom orthotics if the force of pronation is too great to control with OTC devices. However, treating bunions with any insert is always a delicate balance between support and shoe crowding. Other biomechanical changes would be selecting shoes that are stable and with a wide enough toe box to accommodate the bunion. You do not want to wear too loose of a shoe as it leads to instability and other problems. Make sure you feel stable in any shoe your select. Make sure when you are selecting shoes that you feel that you rolled through the center of your foot and not through the big toe joint at push off. 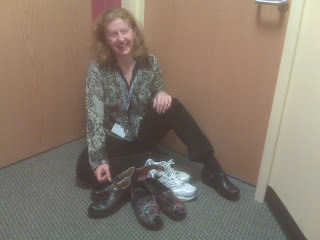 Here Dr Jane Denton, my partner for 31 years, goes through great lengths analyzing the proper fit of shoes. Select shoes that do not put too much pressure on the bunion area. If there are slight pressure problems in some of your shoes that are not relieved with the felt padding, try to have local shoe repair store stretch them. They need to take them overnight to do a proper job. This photo just demonstrates the fact that a shoe repair store can soften the leather in any spot like for a bunion. Many of my patients buy their own ball and ring stretchers and leather softening spray to do this themselves. This Aetrex running shoe called the "Edge Runner" is a stability shoe with a lock down heel strap that can be great for patients with orthotic devices that slip in the heel. I am a normal healthy 19 year old college student. I played sports in high school but in college I have stayed active by going to the gym usually 5 times a week. Going for runs maybe every few weeks. I started feeling pain in my toe around April. I got x-rays done that showed nothing. I later got an MRI that showed swelling and bruising of my sesamoid. My doctor is very unclear when she tells me issues with my feet. I will be seeking a second opinion. From what it sounds like this is a fracture. I have been in a walking boot for 8 weeks and I have no signs of improvement. Dr Blake's comment: It is normally hard to tell at this stage how you are doing. Sesamoids do heal usually, but the soreness in the area from swelling, stiffness, nerve hypersensitivity, muscle tightness can make it difficult to gage. I have been on my feet maybe a few hours a day ( not consistently) My doctor is heavily pushing surgery. That is my last option. Dr Blake's comment: Surgery is done when the chance of healing is over. You have alot of healing ahead of you. I would want to see a CT Scan with definite bone fragmentation to even start a discussion on surgery. It is already late June and I would not be in good health to walk all around my college campus come august. If I get the surgery I would have to take a semester off. I am in a great deal of pain. Dr Blake's comment: A big question is why are you in a great deal of pain. You should have 0-2 pain in your removable boot with some off loading pads or hopefully an off loading orthotic device. This would be the same orthotic that will help to wean you off the boot. Over the next month, while remaining in the boot, make sure you are ice packing for 20 minutes twice daily, doing a full contrast bath once a day, learn to spica tape, and have some great orthotics made. If the CT scan shows the fracture line, no fragmentation, ask for an Exogen bone stim for 6 months to help with the healing. I got a walking scooter to hopefully take the pressure off my foot. I have knee pain in the other leg since I've been in this boot for what seems forever. 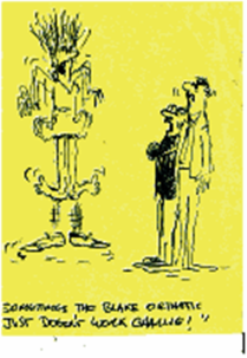 Dr Blake's comment: Please make sure you have an EvenUp for the other shoe to help balance you. Typically at the 3 month mark, if you have a good pair of off loading orthotic devices, you begin to wean gradually out of the boot. This can take 2-6 weeks, and you must keep the pain level between 0-2 the whole time. The more you actually off weight the area, the more it swells, and the more it hurts. So, off weighting is a good way of being convinced you need surgery. What is your opinion on this? 8 weeks seems like a long time to see no progress. At times I get a throbbing pain that lasts for a few minutes at a time. Have you seen success with the bone stimulator in situations similar to mine? Dr Blake's comment: Definitely, I would go to the bone stimulator as soon as the diagnosis is made of sesamoid fracture, but it is great to start it now, especially if someone thinks that surgery is going to be needed if the bone stim fails. I am trying to stay off my feet for the next two weeks but my doctor said if there is no improvement in 10-14 days she wants surgery. I am emailing to say thanks so much for your blog - it is the clearest, most thorough and most practical site I've come across in all my web searching and I really appreciate it. I can only imagine how busy you are already answering all the questions on your blog, but I'm also emailing to ask if you could possibly give me some advice. I have had pain in the ball of my foot for the last 5 1/2 months. At first it was intermittent pain, which felt like a stone bruise under the ball of my foot, but gradually it became more persistent and more painful. Now it is painful all the time and feels like a hot needle in the joint. Originally I was walking to and from work each day, but had to reduce the amount of walking I was doing, and then reduce it again, and then stop altogether. Despite this, the pain continued to get worse. Dr Blake's comment: Okay, you have Hallux Limitus Rigidus/Limitus with degenerative arthritis in the big toe joint. The pain you get is that the joint between the lateral sesamoid and first metatarsal head is inflamed, and everytime you put pressure on the lateral sesamoid it pushes against the sore inflamed first metatarsal head. I know you've already answered some questions on sesamoids, all of which I've read, and that has been really helpful. However, I still am at a loss as to how I should proceed with my own sesamoid problem, and I have received a lot of clearly conflicting (at at times plain wrong) advice so far. Dr Blake's comment: First of all, you have had this process for years slowly developing, so why does it start hurting now? You can take 2 approaches: remove the lateral sesamoid (not my first choice but probably helpful), or go 3 months in a removable boot with off loading padding and bone stimulator to see if that really calms the joint down. Following the 3 months of boot is a 3 month weaning process off the boot developing protective weight bearing orthotics, shoe selection issues, and foot re-strengthening. Since my diagnosis I have been frantically googling to try to find out more, but most of what I read is about stress fracture (rather than chronic inflammation). What I have read online about sesamoiditis is about the tibial sesamoid, with very little written about the lateral sesamoid. I'm really surprised by the diagnosis because I'm only 45 and I don't fall into any of the usual risk groups - i.e. I've never had an injury to the foot, I never wear high heels, I've got no family history of arthritis, I've never been overweight, I've never had a job where I had to carry heavy loads, and I've never been an athlete and have never been a jogger or done any high impact sports. I don't have lupus, and I've only got this in one joint, so I understand that means I don't have rheumatoid arthritis. Dr Blake's comment: Unfortunately, simple mechanical issues like a long first metatarsal and big toe, and/or over pronation can slowly breakdown the joint (along with other issues). The process could have started 30 years ago, and been quite glacial in developing. Do you have a toe first toe? Do you over pronate? How is you bone density and Vit D levels? The orthopaedic surgeon I saw said that what I had was extremely difficult to treat, that surgery was not an option he would recommend (or do), and suggested an orthotic cut out. He referred me on to get a steroid injection, which I'm getting in two days time. He seemed a little non-plussed when I asked him about follow up, and when pushed, suggested I see him again in three month's time. I've decided I need to rest my foot more to give the cortisone injections the best chance of success so I've arranged for one and half weeks off work after my steroid injections this week, and I've arranged non-teaching duties for the next half a week after that. Dr Blake's comment: Please avoid the cortisone, unless it is short acting. The long acting can make you feel great for 9 months while you are continuing to do damage. At least think it through as well as you can. I tend to recommend cortisone shots in these situations when surgery is the only other option. I personally think you have many options. The orthopaedic surgeon said that there is no exercise I can do that will make it better or worse - I find this hard to believe as although I understand that osteoarthritis is a long term degenerative condition, in my experience there is always some kind of exercise that can have a good or bad effect. I'm contemplating seeing a sports medicine doctor for a second opinion in the hope that someone like that would be more interested in rehabilitation options. Dr Blake's comment: Sure, you want to avoid exercises that emphasize bending the toe at push off, but elliptical and cycling, and swimming can normally be done safely (perhaps with a slight modification). So, what makes the pain worse are standing, walking and balance exercises. Dr Blake's comment: You need to develop orthotics that off load enough to allow for standing and flat foot walking. You can balance in the middle of books arranged where their is a hole for the big toe joint to sit in to off weight. You really need to be placed in the Immobilization phase however for right now. If you use an Anklizer boot with float to off weight and then ice pack 20 minutes 3-4 times a day to bring the inflammation down. Foot exercises (toe spread, metatarsal lift, theraband around toe) - but these made it worse, especially the theraband, so I stopped. Dr Blake's comment: This is because you are in the Immobilization/Anti-Inflammatory Phase of Rehabilitation. These exercises will be great 4-5 months from now. Calf muscle release - didn't seem to make any difference so I stopped. Dr Blake's comments: I would save the pills, and go to direct icing, and perhaps once a day contrast bathing with one minute heat/one minute ice repeated for 20 minutes. It may be too early however for any heat. Cushioning - originally metatarsal pad (given to me by podiatrist), then a metatarsal pad that I cut a hole in for the sesamoid, but now after online research, I've fashioned a type of dancer's pad made of 1/4 inch foam. Dr Blake's comment: Great, I love my dancer's pads!!!! Arch support - through taping and through a store bought with arch support. Have since been told (by orthopaedic surgeon) not to bother with arch support. Dr Blake's comment: I love the red Sole insert which is in stores all over (like REI). You can adjust them endlessly since there is no plastic. Sometimes, a shoe repair store, which their handy dandy grinders can help if you need to remove an edge. The role of the arch support is two fold--shift weight into the arch and shift movement towards the center of your foot if you pronate as you roll through your foot into push off. Toe taping - I'm also now taping my big toe to restrict upward movement. Dr Blake's comment: Yes, I love Spica taping!!! Icing - Generally my foot hasn't looked obviously red or puffy but I've been icing it one to two times a day. However, I went back to one of the many physios I've seen last week and he noted that the tendon area looked puffy. Dr Blake's comment: Ice, ice and ice. At least with icing you can multi task. You can ice the bottom of your foot while brushing your teeth, checking emails, eating breakfast lunch and dinner. 5 minutes minimum and 20 minutes maximum. Cam boot - At no stage has any of the physios, podiatrist, doctor or orthopaedic surgeon suggested immoblisation of my foot (despite the problem previously being misdiagnosed as a stress fracture). However, I've decided to give immobilizing it a try, and have rented a cam boot which I've been wearing (with my foam dancer's pad and toe taping) for the last 5 days. Dr Blake's comment: Yes, minimum of 3 months!!!! Up until this point, I've been continuing to go to work, and to my weekly pilates class, but I have cut out all other exercise except that which I can do at home on a mat. Dr Blake's comment: You need to create a pain free environment. Try to keep the pain level between 0-2, no matter what you are doing. I've asked my usual physio to help me put together an exercise programme for the future that replaces the daily walking I used to do with something else, but think for the short term I really need to stop using my foot. This is a problem for me as I have nerve pain down my back that I usually manage through various forms of exercise, the main one being walking (and making sure I don't spend too much time seated). I also have a job where I'm on my feet a lot (teaching). Dr Blake's comment: Make sure you purchase an EvenUp for the side that does not have the boot. It will help protect your back. And if so, for how long? 3-6 months really, but we can talk when you have been 1 month straight in the removable boot and 0-2 pain level has been maintained. Up till my steroid injection? And after my steroid injection? Please delay thoughts of cortisone for now, unless it is only short acting, but I would ice for a month first and wear the boot and see how the inflammation goes down. What is usual follow up after steroid injections into a joint - the orthopaedic surgeon said to see him in three months, but shouldn't I have a follow up appointment sooner than that? Isn't it common to need more than one steroid injection? Do you have any recommended rehab exercises I should do after the injection? What's the best shoe for someone with my problem? Are rocker type shoes worth the money? Is a stiff soled shoe the best, or a more cushioned type shoe better? Typically you go from removable boot to stiff soled shoe like a Hike and Bike or New Balance 928. While you are in the boot, you are getting a bone stimulator (Exogen) and getting your orthotics perfected with the right arch support and right amount of dancer's padding. Why is the lateral sesamoid less commonly a problem than the other sesamoid? Supposedly it bears less weight than the tibial, especially when you pronate or if you have any amount of bunion. Both off weight the lateral or fibular sesamoid and load more the tibial sesamoid. Does this make it harder to treat? Does this have any implications for treatment? Yes, but not really. Subtle padding issues, surgeons more prone to just remove. I think you have more Hallux Rigidus symptoms right now, and less sesamoid technically. The sesamoid and lateral first metatarsal head cartilage issues means a bone stimulator is crucial. Why have I got this and will it continue to get worse? Sounds degenerative which is somewhat luck of the draw. For me it is my back, another the hips, another the ankle, etc. Yes, but learning to live with a problem like this is what sports medicine is all about. Do not feel alone, the world is with you!! And one of my Golden Rules of Foot: Teach the patient, not the imaging results. Another Golden Rule of Foot: Listen to your Body and let it help you create a healing environment. (I know you probably can't answer that, but it is really playing on my mind!). I'm very worried about the long term prognosis for my foot because I'm quite shocked at how quickly it has deteriorated. The pain came on quickly, called a flareup (your first one, which is also the most disconcerting one!! ), but the process is very slow in general. You will learn this next year how to minimize the time of flareups, what activities pick on it the most (I purposely gave up golf with my back due to the torque, but have been able to play full court basketball with no problem), develop a relationship with a good orthotic maker, begin a lifetime of foot strengthening exercises, learn to select shoes that you do not pronate into, etc etc. A bunch of learning!! As I said before, I'm sure you are very busy, but if you can shed any light at all on any of the above, I would really, really appreciate it. Thanks very much for taking the time to answer my email. I'm going to do some reading up about Hallux Rigidus, as suggested. And don't apologise for disagreeing with previous advice about the steroid injections - I know everyone has a different take and in the end I will have to make my own decision. My GP has, like you, said that I’ve probably had arthritis for a long time, but only noticed it because it got inflamed and didn’t settle down. She seems to think if I can calm the inflammation down, it should improve, so she's supported the idea of the injections, but honestly, I not sure what I'm going to do. Dr Blake's comment: You can also consider an 8 day Prednisone (oral cortisone) Burst or 5 PT visits using topical cortisone with Iontophoresis. I think she's probably influenced (as I'm sure I am) by the fact that I need to keep active to manage the other ongoing muscular skeletal problems I have. I am tempted to do the injections and do the immobilisation and all the icing, contrast baths, supplements etc that I can, basically blitz it with everything I can. Anyway, I've ordered an 'evenup' and am going to keep going with my gut (and your advice!!!) in the meantime and keep on immobilising my foot. I'm interested in the EXOGON device you recommend - I read about this in a post on your blog from another person in Australia (that's where I live), and he mentioned renting one. I'm going to investigate it further. How long do people use these for - is it for long term maintenance of joint cartilage or just for acute stages? Dr Blake's comment: It is for the next 9 months to see if the cartilage under the first metatarsal head and the injured sesamoid can strengthen themselves. In regard to your questions: . Do you have a long first toe? .Do you over pronate? How is you bone density and Vit D levels? No other problems with any other toes. No real biomechanical problems (according to a couple of podiatrists in the past about other issues), bone density fine (got it checked after I was initially told my foot problems was a stress fracture) and I'm guessing my Vit D levels are fine as I live in a sunny place! Dr Blake's comment: There are 3 phases of Injury Rehabilitation--Immobilization, Re-Strengthening, and Return to Activity. You definitely need to be in the Immobilization Phase. The Removable Boot and Anti-Inflammatory measures should really calm your foot down. However, some foot strengthening and some cardio/core workouts are not only fine but crucial to a faster rehabilitation. You have to see the post entitled Good vs Bad Pain and memorize it. Keep the pain level between 0-2. Swim in the deep end of the pool if you can control the pain level, cycle 100 miles if the shoe or pedal position can be modified to avoid irritating the area consistently. And finally, in response to your comment: You will learn this next year how to minimize the time of flareups, what activities pick on it the most (I purposely gave up golf with my back due to the torque, but have been able to play full court basketball with no problem), develop a relationship with a good orthotic maker, begin a lifetime of foot strengthening exercises, learn to select shoes that you do not pronate into, etc etc. A bunch of learning!! Yes, I know what you mean, it is a life long project. Unfotunately at times it feels like learning to adapt and compromise is neverending as I already have learned to manage chronic pain from ongoing back and shoulder problems. Thanks very much for your advice and words of support in your reply on your blog. My big toe on my right foot is very swollen. It is about twice the size of a regular big toe. The swollen part is very warm, and very painful if I touch it .I can't wear a shoe on my right foot, it is very painful to even try to put a sock on my right foot. My toe and foot have been this way for over 2 weeks now. I'm still unable to wear a shoe. I can wear one of my husband's big socks. I do try to walk on my foot during the day, but the pain on the bottom and left side of my right foot is sometimes too painful to even try. I haven't been to a doctor, yet.....just like other people in the USA, it's a money problem. I'm not asking for a 'hand out' or anything, like that. I would just like to know what's going on with my foot. Thanking u in advance for any help I can get from u for the diagnosis of my toe. Do you see any sign of an ingrown toenail that got infected? Did you cut your nails 4-5 days before the onset of pain? Do you have any infections in your body at this time or at the time of onset? Respiratory, urinary tract, etc. Can you send a photo of both big toes? Do you have any systemic signs of infection like fever, malaise, chills, or painful areas above your foot? Do you tend to stay hydrated or not? Is there a family history of gout or another systemic disease? Could you have been exposed cold somehow? How is your overall circulation in your feet and extremities? Did anything happen in the 3-4 days prior to the onset of swelling like dropping something on your toe or starting a new exercise program or changing shoes? Send me a close up on the nail itself please. What medications are you on for some can cause gout?